Permissible Uses: Retail, Restaurant & Bar, Banks, Public and Private Schools, Event Space, Bowling Alley, Museum, Art Gallery, Library, Dry Cleaners, Barber, Beauty, Manicure shops, Repair shops, Printing shops, Drive-In and Drive-Through Facilities, among others. Memorial Drive – Martin Luther King, Jr. Drive Area Revitalization Plan (2001). The City of Atlanta's Comprehensive Development Plan serves as a guide for how the city should grow over the long-term. The future land use of the Harp Transmission site in the Comprehensive Development Plan is low-density commercial. The Memorial Drive Greenway Concept Plan calls for the Harp Transmission site to be a potential restaurant/beer garden. The Harp Transmission site is listed in the Imagine Memorial study as part of an area identified as an "Activity Center." Activity Center is defined in the plan as "areas which serve as local nodes for transportation, commercial, and public activities. They may be public parks, schools, local retail corridors, or large commercial developments where multi-modal transportation users are likely to gather." The site of Harp Transmission is not identified as future park land in the Atlanta Beltline Master Plan - Subarea 4. The first Land Use and Urban Design Goal of the plan is to "Encourage a variety of uses at appropriate locations within the subarea to support future transit, promote reuse of historic properties, facilitate economic growth and improve community health." 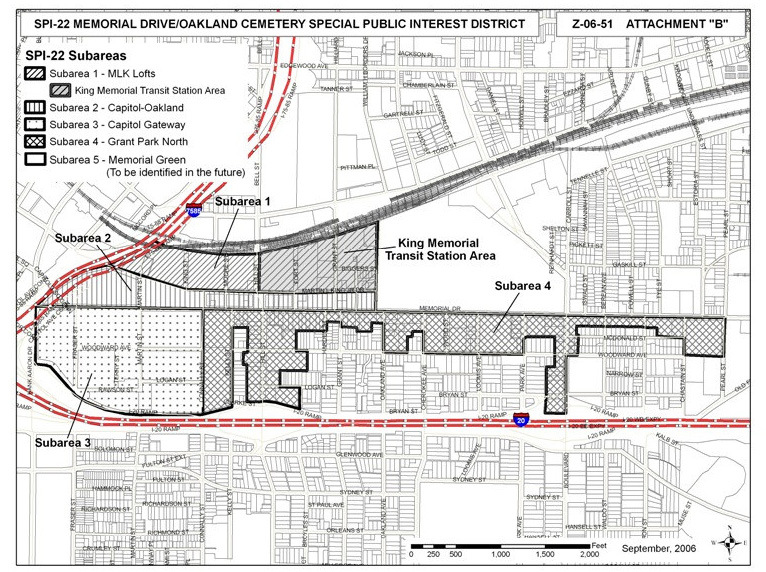 The Harp Transmission site is located in Project Area C of the Capitol-Oakland section of the Memorial Drive - Martin Luther King, Jr. Drive Area Revitalization Study. This area calls for "An historical interpretive center for Oakland Cemetery and area neighborhoods will be located in and adjacent to the Park at the Oakland Cemetery main gate. This area may also be used by residents and visitors as an orientation point for visits to the State Capitol (to the west), the MLK Center, King Neighborhood and Auburn Avenue (to the north) and Zoo Atlanta and the Cyclorama (to the south). This center may be developed as part of an adjacent mixed-use complex and could include facilities for tour busses and visitor parking. In addition, individual pavilions housing displays on State and Local history, the area’s Civil Rights history, Ecologically Friendly Urban Design, or other subjects may be located throughout the park."